Jacqueline Goldfinger’s Slip/Shot premiered in Philadelphia just weeks after Travon Martin was shot in Sanford, Florida in 2012. Though Goldfinger sets her action in Tallahassee circa 1962, the story sharply resonates with our current sad headlines coming out of Ferguson, Missouri. The play revolves around a young black man being accidently shot by a befuddled young white security guard. The play is well intentioned but does not entirely jell as a complete work. Some of the larger insights pronounced by its four principles seem unearned. We don’t know enough of the particulars of these people to appreciate their greater thematic pronouncements. The character’s language becomes quite poetic at times, but doesn’t always ring entirely true to their specific settings. The opening scenes were slow in developing as they shuttled back and forth between Miss Athey with her son Monroe and Clem with his girl Kitty. Monroe is about to become the first from his family to attend college. He was to be part of the integration process at Florida State. Faith Russell has wonderful moments as his grieving mother; her work is the centerpiece of the production. Quinn Armstrong portrays a wiry intensity as the tortured young murderer, Clem. Marquicia Dominguez has some shaky moments early on as Monroe’s girlfriend, but finds surer footing as the play progresses. Treavor Boykin as Monroe and Jocelyn Maher as Kitty both do solid work. The play hits more right notes in its latter scenes. Images of locked doors and windows, families realigning on the fly, stormy nights and new babies help the work achieve a thought provoking conclusion. Trevor Cushman and Roy Stanton round out the cast as associates of Clem and continue in the tradition of quality acting that the Seattle Public Theater so consistently produces. The production qualities are outstanding throughout. Paul Arnold ably lights the various scenes, moving from warm summer nights to threatening winter storms. Evan Mosher and Andre Nelson handle the theater’s new sound system. 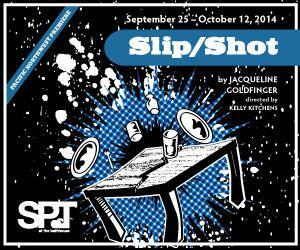 Slip/Shot runs through October 12, presented by Seattle Public Theater at the Bathhouse on Green Lake. For ticket information call 206-524-1300 or go on line to www.seattlepublictheater.org.